I think this would help readers. I kind of don’t get it. How does the decrease in international velocity of money lead to the youth not having jobs? I don’t see the causation. ANSWER: The VELOCITY of money is how fast people are spending and using money – its turnover rate. The higher the turnover rate (velocity), the more people are spending and investing. The lower the rate, the more people are hoarding money (saving for a rainy day) and thus economic activity declines. 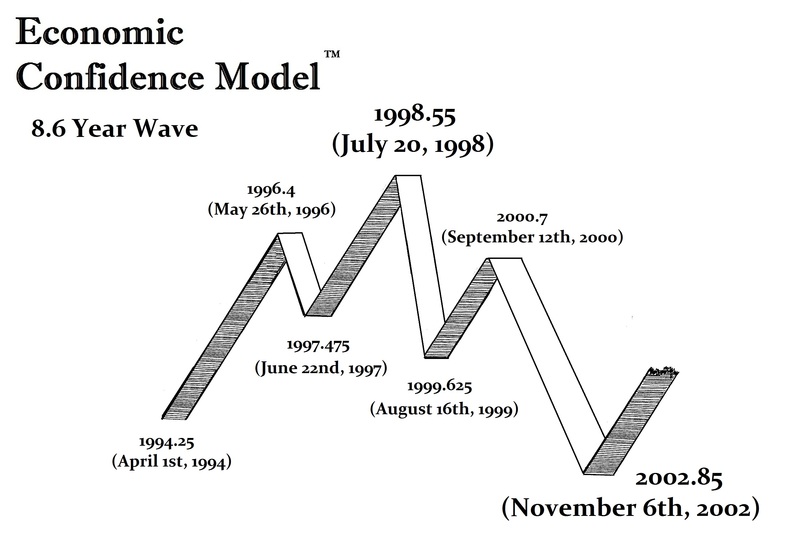 Now compare the VELOCITY of money which, peaked in 1998 with the Economic Confidence Model. From that point onward, it is not that the rich are getting richer and the top 1% is getting everything, this argument is very misleading. Rich “individuals” are NOT responsible for messing up anything, instead it is the complete change in the banking system and the abandonment of Relationship Banking combined with the continual rise in taxation. This is what I have been so very concerned about and why I have stood my ground against transactional banking. With conspiracy theories about everything under the sun and the dark sinister forces people create in their minds, the evidence clearly indicated that we are on a course of self-destruction that began with the turning point 1998.55. The banks have become traders ever since the repeal of Glass Steagall in 1999. The VELOCITY of money continues to collapse, for the big money center banks would rather trade with money for profit than lend into the economy on a relationship basis, which is what creates jobs – not trading. The fractional banking issue applies to lending but not to trading. Banks have over $2 trillion parked at the Fed in EXCESS RESERVES – that is money not being lent into the economy, which reduces the fractional banking ratio and the VELOCITY. That is money that banks are simply parking at 0.25% since they pay nothing for the funds now. 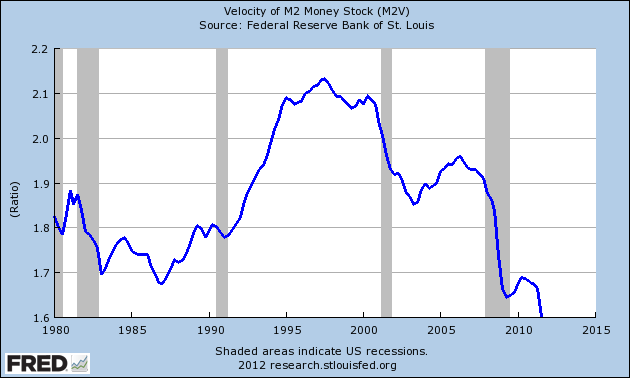 Just look at what has taken place with the VELOCITY of money since 1998.55. 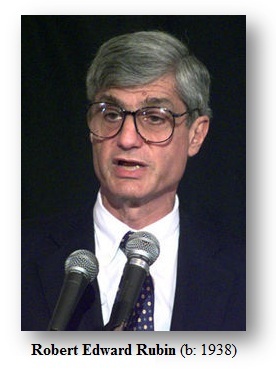 It was 1999 that saw Goldman Sachs’s Robert Rubin lead the charge in government to repeal Glass Stegall in 1999. That was the critical change to the entire banking system and the real birth of Transactional Banking. It was that 1998.55 turning point that led to the collapse of Russian bonds that were being supported by the IMF loans which resulted the the collapse in Long-Term Capital Management. Liquidity has continued to decline within the markets as a whole and this is caused by rising taxation so more and more people find their net disposable income decline reducing capital for investment. Social Security is the theft of money from the public that only buys government bonds while politicians love to point at the fact that the rich get richer and Obama wants to raise taxes on investment income. If government allow that SS fund to buy stocks back when I worked on that solution when the Dow was 3500, the fund would be solvent today. But government has robbed the working man, uses their forced SS funds that are not refundable, hand a refund check only for income taxes at year-end, and never pays the working person interest on their money for the year. It is government that has robbed the people of investing and then blame the rich because they invest when it is not an even playing field. It is government which suppressed the average person and them blamed the rich. This is EXTREMELY dangerous and this is the CAUSE of the deflationary trend when taxes rise, disposable income declines, investment drops and no small business rises resulting in the lost generation of the the youth. It is small business that employs 70%, not big corporations. The big money center trading banks have been not the conquerors of the economy, they have sealed their own death wish. When the next crash comes, government will find it harder and harder to keep supporting the banks against the people all to keep Transactional Banking alive. They cannot see that they will be trading only with themselves and that will be their downfall. The term Black Friday was not a shopping day. It was when they stormed Wall Street and hanged the bankers. Greed and stupidity will be their downfall. They can buy candidates on both sides of the aisle. They can hire family member as is the case with Hillary Clinton. But they cannot stop the impending collapse for they continue to rig the game just buying politicians, which cannot keep the economy alive with laws.